After yesterday's slight hiccup about VAT treatment of the Sctrappage Scheme, Ford and Honda have announced that they will take part. Ford has actually taken more than 3,000 extra orders from first-time customers in the new car market, thanks to the Government's vehicle scrappage scheme. 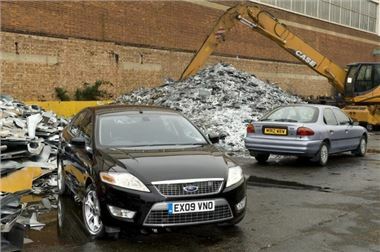 Customers had been placing orders with Ford dealers since scrappage incentives were announced last month and vehicle deliveries will commence tomorrow (Wednesday 20th May). Motorists are attracted by Ford's supplementary offers which have reduced the price of the sought-after Ford Fiesta top seller to £7,995. And the Ford Focus, the UK's most popular new car last month, becomes £9,995 to customers replacing vehicles of 10 years or older. Scrappage scheme incentives bring the new Ford Ka within a £6,000 budget, while the Ford Fusion starts at £8,745 for motorists replacing pre-September 1999 vehicles. The Ford Mondeo becomes available for under £12,900. Other scrappage savings are on offer across Ford's car and commercial vehicle range, including a seven-seater Ford Galaxy MPV for only £17,195 and a minimum £2,000 discount on Ford's Fiesta Van, Transit Connect and Transit models. Nigel Sharp, Ford Britain managing director, said: "Ford is putting its full weight behind the UK vehicle scrappage scheme, which will not only boost sales but will also bring positive employment and environmental benefits too. Ford's substantial backing of subsidised vehicle scrapping helps to secure the 100,000 auto industry jobs in the UK dependant on our company, dealerships and suppliers."